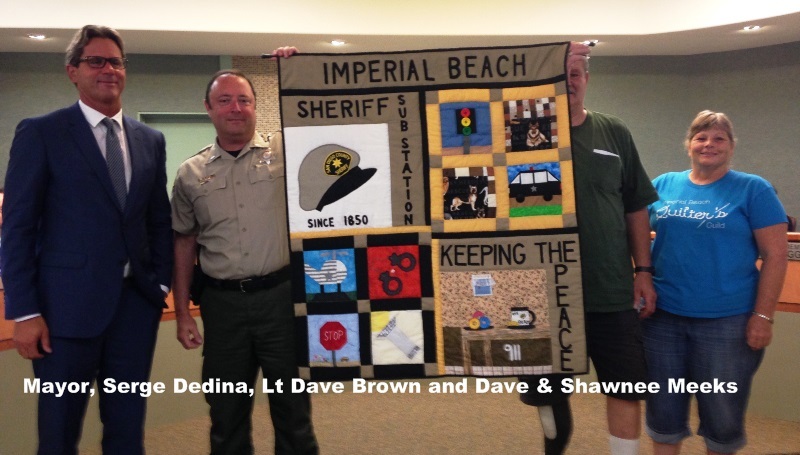 The Imperial Beach Library’s Thursday Morning Quilters Presents Sheriff Department with a Handmade Quilt at Wednesday’s City Council Meeting. The Imperial Beach Library’s Thursday Morning Quilters presented our Sheriff Department with a handmade quilt at the City Council Meeting. The one-of-a –kind quilt featured hand stitched squares representing various aspects of the Sheriff Department. The Quilters wanted to thank the Sheriff Department for their dedication and support of the community. The Thursday Morning Quilters have been meeting every week at the library since 1986.